Upstart crushed the 8 horses who raced against him and emphatically put his name on the list of top Kentucky Derby contenders. 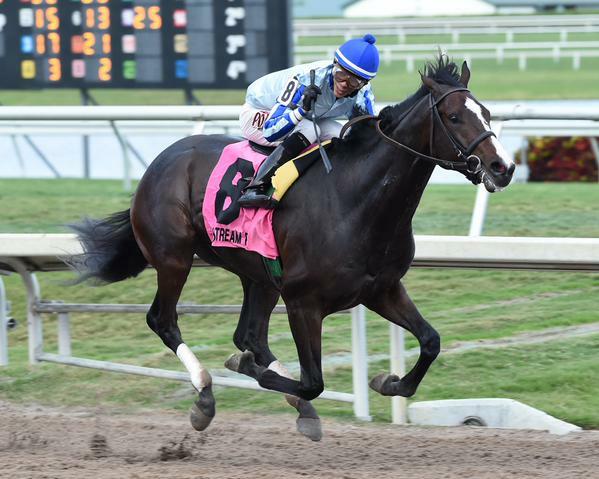 Upstart, ridden by Jose Ortiz, won by 5 1/2 lengths after drawing away in the stretch. Even before the race, the complexion change slightly with the decision by the connections of Dom The Bomb to run in the Hutcheson Stakes in race 7. He was seen as a pace threat if he were to have run in this race, but instead he finished last in the Hutcheson after pressing the pace. 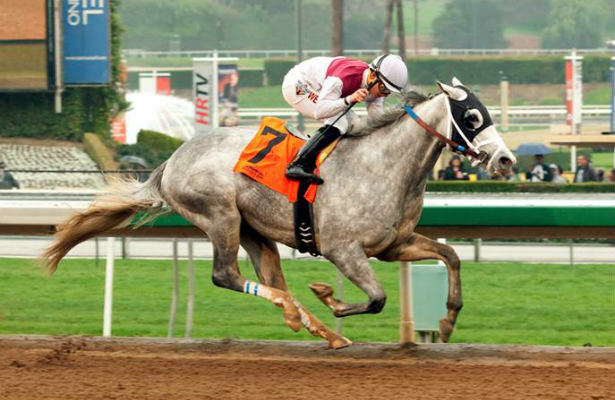 The Holy Bull began with Bluegrass Singer breaking well and taking the lead from the start. First Down was a length behind him and Upstart sat off his flank. Behind the trio were Decision Day, Frosted, and Juan and Bina. The trailing trio consisted of Keen Ice, High Noon Rider, and Frammento. Bluegrass Singer continued to lead the field as they marched down the backstretch and on the far turn as well. Upstart moved up to second on the backstretch and continued his charge on the turn with First Down battling in third though he was struggling to keep up. Frosted was in fourth, Juan and Bina was in fifth position on the far turn, and Keen Ice was sixth. Frammento moved up to seventh, High Noon Rider was eighth, and Decision Day fell all the way back to last. After being forced to go 4 wide on the turn and entering the stretch, Upstart took over the lead and pulled clear to win by 5 1/2 lengths. Frosted was no match for Upstart, but still was able to grab second over Bluegrass Singer who finished 7 3/4 lengths behind the winner. Juan and Bina finished fourth by 9 1/2 lengths. The final order of finish beyond the top four was Keen Ice, Frammento, First Down, Decision Day, and High Noon Rider. High Noon Rider did not finish the race, as he was pulled up and walked off. The final time for the 1 1/16 miles was 1:43.61. Upstart went off as the 2-1 second choice. He paid $6.20 to win, $3.20 to place, and $2.40 to show. He is trained by Rick Violette. Upstart earned 10 points towards the Kentucky Derby Leaderboard and the win gives him 16 points total thus far. Frosted earned 4 points for the second place finish to give him 8 points while Bluegrass Singer and Juan and Bina both earned their first points of the Road to the Kentucky Derby. The Road to the Kentucky Derby takes a week off before returning on Saturday, February 7 with the Withers Stakes at Aqueduct and the Robert B. Lewis at Santa Anita. The only Kentucky Derby Prep race this weekend will take place on Saturday, January 24 at Gulfstream Park in Hallandale Beach, Florida in the form of the Holy Bull Stakes. This Grade 2 event will be 1 1/16 miles over the main track with 10 three-year olds entered. The Holy Bull Stakes represents the first of three races at Gulfstream that serve as Kentucky Derby prep races. The other two are the Fountain of Youth on February 21 and the Florida Derby on March 28. The purse for this event is $400,000 and post time is scheduled for 4:34 PM Eastern Time. Showers are expected in the morning, however, the track should be in good shape come race time. As with all the races thus far on the Road to the Kentucky Derby, this race will feature points awarded in the format of 10, 4, 2, and 1 to the top four finishers respectively. Let’s take a look at each horse in the Grade 2 Holy Bull Stakes. 1. Frosted (5-2 Morning Line) – This son of Tapit has never finished outside of the exacta in his 4 career starts, but three of those races were in the maiden ranks. His fourth career start was the Grade 2 Remsen where he finished second by a half-length and could not reel in the winner. In addition, that race was on November 29, but his workouts have been very good in this return. He is a horse that figures in this race. 2. Keen Ice (6-1 ML) – He too exits the Grade 2 Remsen and he finished a well beaten third 8 1/2 lengths behind the winner. His other start in graded competition was the Grade 1 Breeders’ Futurity at Keeneland where he finished 5th beaten 13 lengths. It feels as if he is a step behind the horse to his inside and will need this race as a tightener. 3. High Noon Rider (15-1 ML) – A pair of turf tries resulted in a sixth and third place finish at Belmont Park before he broke his maiden in an off the track affair at Aqueduct on November 19. He shipped to Remington Park for a listed stakes race where he finished third by 4 1/2 lengths over a muddy track. There are mixed feelings about him, but his best chances seem to be finishing underneath in the exotics at best. 4. Bluegrass Singer (4-1 ML) – He is far and away the most experienced horse in this race with 7 career starts (the next highest amount is 4 starts shared by 6 different horses). After a poor debut in August, he has finished on the board in last 6 starts and his last two starts are both wins here at Gulfstream Park. Both of those races came at the one turn mile distance and he went gate-to-wire as well. He should be able to control the race from this post and rates a big threat to the top 2 morning line choices if he is to run in this race (he is cross-entered in the Hutcheson Stakes, which is race 7 on the card). 5. Juan and Bina (20-1 ML) – He broke his maiden in his debut and subsequently was entered in back-to-back stakes races with mixed results. In his second race he finished second by 4 1/2 lengths before losing a duel on the lead with the horse to his inside last out. He ended up finishing fifth by 14 lengths and will have make a big step up to contend in this spot. 6. First Down (12-1 ML) – The Super Bowl is still more than a week away, but that does not mean one cannot make a hunch play on this guy. He broke his maiden at Belmont by three-quarters of a length in his debut. In that race he beat the rail horse in this race (Frosted). His next start was the Grade 2 Nashua and he was crushed finishing fourth by 10 lengths. He has not raced since then and his works have been rather pedestrian. His trainer, Tom Albertrani, is batting 0 for 35 this meet at Gulfstream. One positive is First Down will be on lasix for the first time. 7. Frammento (12-1 ML) – In four career races he has never finished worse than fourth, but he has not raced in a higher class than an optional claimer. His latest was a second place finisher to Bluegrass Singer, who makes an appearance in this race as well. He does have two decent works since that race and Nick Zito, but he will have a tough time contending for the win in this race. 8. Upstart (2-1 ML) – The morning line favorite in this race began in a New York bred maiden special weight at Saratoga before moving up to the New York Bred Stakes ranks. He won both of his career starts and then was thrown into the deep waters in the Grade 1 Champagne at Belmont. He finished second by 2 1/2 lengths and followed that up with a third place finish in the Grade 1 Breeders’ Cup Juvenile. His works have been very good leading up to this race and he is an obvious candidate for the win. 9. Dom The Bomb (30-1 ML) – The Illinois-bred son of Bring the Heat is an impressive 3 of 4 in his career. He broke his maiden in state-bred competition at Arlington by 4 3/4 lengths and then went to Keeneland and finished fourth by that same margin. A return to the Prairie State did him well as he won by 11 lengths in the Sun Power Stakes. His latest race was excellent as he crushed 11 foes in his first start at a route of ground while also going two turns. He won by 5 1/4 lengths in the Futurity at Hawthorne on December 13. He does have a front-running style, which will be difficult from this post. If he can rate he will have a chance at hitting the ticket. Do not expect near the 30-1 morning line provided. In addition, he too is cross-entered in the Hutcheson in Race 7. The connections of this horse and Bluegrass Singer are playing mind games to determine which horse will run in which race. 10. Decision Day (30-1 ML) – He sports a 2 for 3 record and his lone blemish was a second place finish to start his career. After that debut, he won a maiden race going a mile and 70 yards before winning the Coronation Futurity at a mile and an eighth by a head on November 29. Unraced since then, he has shown steady works in south Florida leading up to this race. Interesting horse for the exotics. The picks for this race are a bit complicated because it is not known which horse between Bluegrass Singer or Dom The Bomb will run in the Hutcheson and both horses are intriguing from this point of view. Despite the uncertainty regarding those two horses, the top players are still Upstart, Bluegrass Singer, and Frosted in that order. Behind those three, Dom The Bomb, Decision Day, and Keen Ice are the next trio. The final order of horses are High Noon Rider, First Down, Frammento, and Juan and Bina. Be sure to check out the recap of the Holy Bull Stakes on Saturday night. A last to first run gave Far Right the victory in Monday’s ungraded Smart Jones Stakes, but not without a little help from the favorite. Mr. Z veered out badly in the stretch and that ended up costing him the victory. The race began with longshot American Sailor going to the lead and Mr. Z right off his flank by a head. Behind those two was Runaway Bling, Bayerd, Lucky Player, and Private Prospect. The trailing trio were Paid Admission, Hebbronville, and Far Right. The only change after a half mile was Far Right had moved into 8th place, but he found himself in a bit of trouble entering the far turn. There, he had to check as he attempted to make a move. Entering the stretch, Mr. Z looked on his way to victory with a 2 1/2 length lead. American Sailor was still in second with Bayerd in third and Far Right was all the up to fourth. With a furlong and a half to run, Mr. Z started to veer to the right while Far Right came up the rail to power his way to the victory by 1 3/4 lengths. Mr. Z went so far to the right (no pun intended) it ended up costing him second place, as Bayerd got up to finish second. Behind the top three horses were Private Prospect, American Sailor, Hebbronville, Paid Admission, Lucky Player, and Runaway Bling. The final running time for the one mile was 1:38.43. Far Right is trained by Ron Moquett and was ridden by Mike Smith. Far Right is by Notional out of the Vindication mare Zindi. Far Right earned 10 points for the win bringing his total up to 12 points. Bayerd earned 4 points (his first of the Derby Trail), Mr. Z earned 2 points for a total of 12 points, and Private Prospect earned 1 point. The points are crucial for each horse to be guaranteed a spot in the Kentucky Derby. The next race in the Road To The Kentucky Derby is the Holy Bull on Saturday, January 24 at Gulfstream Park. Martin Luther King Jr. day will have the ungraded Smarty Jones Stakes as the lone Kentucky Derby Prep race. This race is the first in a series of four races at Oaklawn Park for 3 year olds that will culminate with the Arkansas Derby on April 11. This race will award 10 points to the winner, 4 points the runner up, 2 points to the third place finisher, and one point to the fourth place horse. The points will help one of these horses get a step closer to a spot in the starting gate via the Kentucky Derby Points Leaderboard. The Smarty Jones Stakes has a field of 9 horses going 1 mile on Oaklawn’s main track. (For those unaware, Oaklawn does not have a turf course). The forecast calls for a sun filled sky with temperatures in the 60’s. The nine three-year olds will be running for a purse of $150,000 with a scheduled post time of 5:38 PM Eastern Time. Below is a look at each of the nine starters in the Smarty Jones Stakes. 1. Far Right (6-1 Morning Line) – The rail horse has quite a respectable resume with a win, two seconds, and two-thirds from 6 career starts. It took him three starts to break his maiden and his first foray into stakes competition was the Grade 2 Futurity at Belmont. He was fourth beaten 6 1/2 lengths while returning to finish third in his next two races in third place. Those two races were the Street Sense Stakes and the Grade 3 Delta Jackpot. He should be able to get a great spot behind the leaders from the rail, but he seems like an underneath finisher at best here. 2. Paid Admission (20-1 ML) – The second longest shot on the morning line enter this race after breaking his maiden last time out in his fourth race. That was at 6.5 furlongs at Delta Downs and now he stretches back out to a mile. His third career start was Churchill Downs going 1 1/16 miles and he finished 7th of 8 that day while being defeated 27 lengths. This guy will need to take a gigantic leap forward to make an impression on this race; pass. 3. Mr. Z (2-1 ML) – The morning line favorite is more than deserving of the odds bestowed upon him. He has run in 7 straight graded stakes races after breaking his maiden. He has faced the likes of Dortmund, Ocho Ocho Ocho, Texas Red, and Carpe Diem so there is little doubt of his class. However, he has just one win from 8 starts with 4 second place finishes. He certainly will be a major factor here, but will his effort be enough to win or finish second again? 4. American Sailor (15-1 ML) – He has run 4 career races with alternating results; 9th, win, 4th, win. He has yet to run past 6 furlongs in his career and this is not the worst spot to try him going long. However, he will need to improve to contend here. Pass on him in this race. 5. Hebbronville (9-2 ML) – His career began with a bang by winning his first two starts and then running second in the Grade 2 Futurity at Belmont on October 5. His next start was the Grade 2 Nashua where he bobbled at the start and was eased in the stretch. He has not raced since that then, but his workouts have been very good leading up to this race. He should be sitting right off the leaders and assuming everything is back to normal for him, he has a chance to get the win. 6. Lucky Player (5-1 ML) – He began his career with 2 wins and a second place finish in his first four career starts before running back-to-back poor races. His fifth race was the Grade 1 Breeders Cup Juvenile where he finished 16 lengths behind the winner in 8th place. After that race, he went back to the Midwest and ran in the Grade 2 Kentucky Jockey Club. He finished 7th beaten 11 lengths in that race. If he can revert back to his Grade 3 Iroquois form he has a chance, but we will let him beat us here for the win. 7. Bayerd (9-2 ML) – Co-second choice on the morning line at 9/2, Bayerd is an intriguing horse. He has 5 career starts with 3 wins, a second, and a third. His first start was a 3rd place finish at Saratoga before he won his second race at Saratoga by 11 lengths. A month later on September 28, he won the Kip Deville at Remington Park by a length. A second place finish in another stakes races was followed up by a second stakes victory last race at 1 mile. He is a very interesting horse with a good shot at winning here. 8. Private Prospect (6-1 ML) – He began his career 3 for 3 including back-to-back stakes wins at Prairie Meadows. Those 2 races came at 5.5 furlongs and 1 mile. His fourth career start was a second place finish in the Grade 3 Arlington-Washington Futurity by a head. His connections parlayed the successful early career into a start in the Grade 1 Breeders Cup Juvenile, but his luck was not as good. He finished 9th of 11 horses, beaten 17 lengths, and took a break after that race. The waters are not as deep in this spot, which bodes well for him. 9. Runaway Bling (30-1 ML) – The longest shot on the morning line is up against it in this race. He broke his maiden in his fourth career start, but the last two races have been atrocious. Those 2 races resulted in last place finishes and he was beaten a total of 45 lengths combined. Another horse to pass on in this race. Check back on Monday evening for a recap of the Smarty Jones Stakes! We sit just two football games away from knowing which two teams will be squaring off in Super Bowl XLIX. The first game will feature the Green Bay Packers at the Seattle Seahawks. The second game is the Indianapolis Colts at the New England Patriots. The Wild Card was good with a 3-1 record based on the predictions made here. The Divisional round was a perfect 4-0 based on the predictions made last week. Let’s make it 2-0 again this week. The Packers escaped last week at home against the Dallas Cowboys with a 26-21 victory. That game, of course, was marred by the controversial call regarding Dez Bryant’s catch near the end zone. That would prove to be the difference. Now the Packers have to contend with the Legion of Boom while Aaron Rodgers still has an injured calf. In last week’s game it was apparent that Rodgers was till feeling the effects of his calf tear. Rodgers went 24 of 35 for 316 yards with 3 touchdowns and no picks. Most impressive was his 13 yard touchdown strike to Richard Rodgers with 9:10 remaining in the game, which was a pinpoint throw between two defenders. The Seahawks defeated Carolina 31-17 last week with a ridiculously impressive performance from Kam Chancellor. Chancellor was all over the field on Saturday night making tackles, nearly blocking field goals, and his 90 yard pick-six that sealed the victory. Rodgers and the Packers will be up against the stingy Seattle defense and the rowdy crowd. 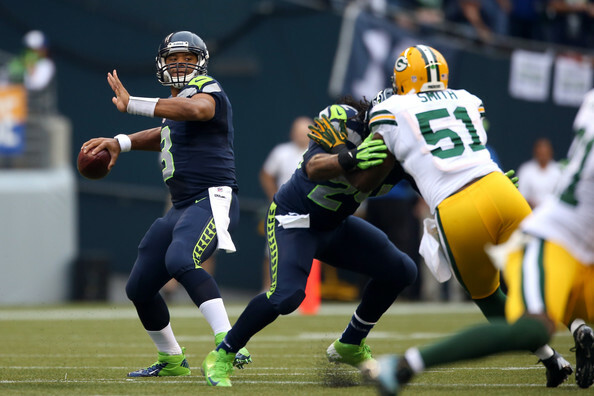 They were crushed in week 1 when Seattle held the Packers to 255 yards of offense in a 36-16 win for the Seahawks. Marshawn Lynch had 110 yards and 2 touchdowns on 20 carries. Prediction: Seattle’s defense, led by Chancellor and the Legion of Boom, will defeat the Packers 23-14. The second conference championship will feature the red-hot Indianapolis Colts taking on the New England Patriots. The Colts are coming of back-to-back wins against Cincinnati and at Denver. More impressively, the defense stepped and confused Peyton Manning. Manning went 26 of 46 for 211 yards and only 1 touchdown. Andrew Luck has shown he was well worth the 2-14 season the Indianapolis fans endured in 2011. He has made nearly every throw and can beat teams with his feet as well. Next up for the Colts is Tom Brady. Brady went 33 of 50 for 367 yards with 3 touchdowns and one interception last week against the Ravens. He also scrambled for a touchdown. All of this was done with the Patriots gaining only 14 yards on 13 carries as a team for the entire game. Of course, many will point to the week 11 meeting in which the Patriots ran all over the Colts in a 42-20 win. Jonas Gray had his breakout game with 201 yards and 4 rushing touchdowns, as the Patriots piled up 503 yards of offense. However, Sunday’s game will be a bit different. Gray has not featured much in the offense during the latter portion of the season for the Patriots while the Colts have surrendered only 99 yards a game in their two playoff games. Prediction: Andrew Luck has struggled against the Patriots with 6 touchdowns and 8 interceptions in three games. The Colts have been crushed in all three games including the Divisional playoff game last year. Luck has thrown for over 300 yards in each game, but will need to take better care of the ball if the Colts are to reach the Super Bowl. Despite how impressive Andrew Luck has been in his short career, this game feels like it will be another New England victory and appearance in the Super Bowl. The Patriots come out on top 38-28. Based on the predictions above, Super Bowl XLIX will be between the Seattle Seahawks and the New England Patriots. For most of the race, International Star was able to save ground, but trouble forced him to the outside. That was of little consequence as he went to the outside and stormed past the two leaders to win by 2 1/2 lengths in the end. The Lecomte was his first win on dirt. The race began with a sharp break from Hero of Humor as he went to the lead. Right behind him was Tiznow R J with Another Lemon Drop three lengths off the lead in third. Runhappy was fourth in the very early stages after a bit of a slow break with International Star, War Story, and Four Leaf Chief behind him. The last four horses were Eagle, Savoy Stomp, Dekabrist, and Killingit. The race changed quickly with Runhappy tugging his way to the lead while racing greenly. He led until the far turn where he began to falter. The lead was contested by a trio of horses; Hero of Humor, Tiznow R J, and Another Lemon Drop. However, there was another trio of horses behind them that were in contention. Those three were International Star, Eagle, and Savoy Stomp. In the stretch, the duo of War Story and Tiznow R J pulled clear from the main group, but International Star a length behind. With a furlong to run, he made his outside move to the lead and pulled clear to win by 2 1/2 lengths. The battle for second was won by War Story finishing a head in front of Tiznow R J. Another Lemon Drop finished fourth by 5 lengths. The final order of finish behind the top four was Savoy Stomp, Hero of Humor, Eagle, Dekabrist, Runhappy, Killingit, and Four Leaf Chief. International Star paid $20.40 to win, $8.80 to place, and $5.20 to show. He ran the one mile and 70 yards in 1:43.62 while being ridden by Miguel Mena. He is trained by Mike Maker and owned by Ken and Sarah Ramsey. International Star is by Fusaichi Pegasus out of the French Deputy mare Parlez. With the victory International Star moves into a tie for first place on the Kentucky Derby Leaderboard at 21 points with El Kabeir. War Story claimed his first 4 points, Tiznow R J has 2 points, and Another Lemon Drop has 1 point. 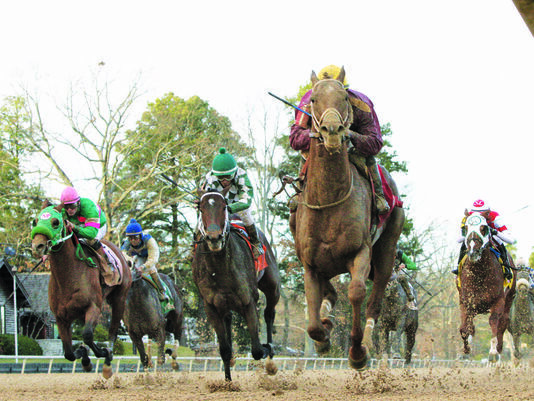 The next race on the Road to the Kentucky Derby is Monday, January 19 with the Smart Jones Stakes at Oaklawn Park. 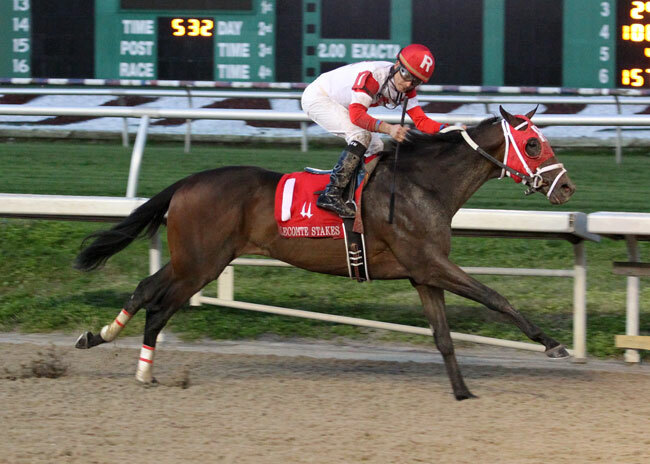 The only Kentucky Derby prep race on Saturday will be the Grade 3 Lecomte Stakes at the Fair Grounds. A field of 11 will run 1 mile and 70 yards over the main track dirt surface. The 11 horses will be battling out for up to 10 points towards the Kentucky Derby Leaderboard. The race is scheduled to go off at 6:24 PM Eastern Time with partly cloudy skies expected. Below is a look at each of the horses starting in the Lecomte. 1. International Star (8-1 Morning Line) – He has not run since November 29 when he finished fourth in the Grade 2 Kentucky Jockey Club. He lost that race to El Kabeir, who came back to win the Jerome two weeks ago. He has worked decently in the interim, but of more concern is his 0 for 2 record on dirt despite being by Fusaichi Pegasus. The jury is still out whether he can run at this level on dirt. Wait and see on him in this spot. 2. Tiznow R J (5-1 ML) – It took him to his third start to break his maiden, but he did so in style here at the Fair Grounds. He won by 13 lengths five weeks ago while going gate-to-wire. He has worked well since that win and should be the controlling speed in this race from the inside post. He certainly has a chance in this race. 3. Four Leaf Chief (10-1 ML) – He owns a 3 for 5 record, however, all of his races have been at lower levels. To be fair, he does sport 2 Louisiana-bred Stakes wins at two different tracks (Delta Downs and Louisiana Downs). Last out he came from way back to grab third, but was well beaten by War Story. His deep closing style will not do him any favors as there does not appear to help his cause. 4. War Story (9-2 ML) – This guy is two for two in his career while employing different tactics in those races. In his debut race he came from nearly 10 lengths back to win by 2 3/4 lengths. In the latest race he was far closer to the pace and took over in the stretch to win by the same 2 3/4 lengths margin. He should be in great position in this race as well and deserves a long look. 5. Hero of Humor (50-1 ML) – He broke his maiden in his second start at Churchill before running 2nd in an optional claimer at Gulfstream Park West on Halloween. However, the last two starts have been dismal in stakes competition. He has been beaten a combined 53 lengths in the last two starts and has beaten only 1 horse. Pass on this guy here. 7. Runhappy (8-1 ML) – He broke his maiden impressively last time out in his debut at Turfway Park. Going six and a half furlongs he took over on the backstretch and powered his way to a 8 1/4 lengths win. The connections feel this son of Kentucky Derby winner Super Saver deserves a chance in the road to the Derby. He is an interesting horse here, but there are more likely contenders as well. 8. Killingit (15-1 ML) – He has ran in four career races with a win, a second, and a third to his credit. Those three finishers, however, came in maiden races. His last start was an Optional Claimer $50,000 where he finished 6th beaten 4 1/2 lengths at one mile. That does not bode well for him in this spot. Pass on him in the Lecomte. 9. Dekabrist (30-1 ML) – The most experienced runner in the field has run 9 times with 2 wins. Those two wins were in his first two career starts at 4.5 and 5.5 furlongs respectively. Since the last win he has not hit the board, nor has he been defeated by less than 11 lengths. Pass on him. 10. Another Lemon Drop (6-1 ML) – He broke his maiden in his second start on turf by 2 lengths before running his last two races on dirt. His latest race was run in the slop here at the Fair Grounds and he won by 5 lengths in an Optional Claimer $50,000. He has come from off the pace in each of his career starts and he does have an outside post here. Both of those are concerns, but he definitely figures underneath in this race. 11. Eagle (3-1 ML) – The morning line favorite has the outside post in this race. He broke his maiden in his debut race on July 5 at Ellis Park by a length before going on 2 1/2 month break. He returned from that break to finish second before his following race at Keeneland provided him his second win. His latest race was the Grade 2 Kentucky Jockey Club Stakes where he finished 3rd beaten only three-quarters of a length. If he can get a good spot before they hit the first turn, he will definitely be there at the wire. Calculator’s first win of his career was an easy one in the Grade 3 Sham Stakes. After sitting just a few lengths of the lead Calculator went to the front midway on the far turn under Elvis Trujillo and pulled away in the stretch to win by 4 1/4 lengths. The race began with St. Joe Bay holding the lead from the rail with Pioneerof The West right off his flank. Just behind those two were Papacoolpapacool, Rock Shandy, and Calculator. The main group was rounded out by Unblunted and Rockinatten. The top 7 were separated by a total of 4 lengths after a quarter of a mile with Hero Ten All last of 8 by 6 1/2 lengths. The positioning did not change much until the horses were on the far turn. It was then that Calculator made his move to the front. At the same time, Rock Shandy started his move, but he was still sitting in fourth. St. Joe Bay was still in second when the horses hit the stretch, but he was 3 lengths behind Calculator. Rock Shandy was in lockstep with St. Joe Bay while Pioneerof The West was back to fourth. Papacoolpapacool, Hero Ten All, Unblunted, and Rockinatten were fifth, sixth, seventh, and eight, respectively at the stretch call. Those four finished in the same positions. It was easy going in the final furlong for Calculator as he went on to win by 4 1/4 lengths. Rock Shandy, who was making his first start on dirt, came on to be second with Pioneerof The West re-rallying for 3rd. St. Joe Bay finished fourth. The final time for the one mile journey was 1:34.88. Calculator is by In Summation out of the Alphabet Soup mare Back To Basics and he is trained by Peter Miller. Calculator earned 10 points towards the Kentucky Derby Leaderboard for his win, which puts him at 14 total and in a second place tie with Carpe Diem. Rock Shandy, Pioneerof The West, and St. Joe Bay earned 4 points, 2 points, and 1 point respectively. Those were the first points recorded for each horse. The Road to the Kentucky Derby continues next week with the Lecomte on Saturday, January 17 at the Fair Grounds and the Smarty Jones on Monday, January 17 at Oaklawn Park. Saturday will showcase the 2015 Sham Stakes at Santa Anita Park. 8 horses will go postward at 1 Mile on the main track in the Grade 3 prep race. The top four horses will be awarded points towards the Kentucky Derby Leaderboard. It will go off as race number 6 and scheduled post time is 6:07 PM Eastern Time. 1 St. Joe Bay (8-1 Morning Line) – He broke his maiden at Santa Anita by 10 lengths in his second start, albeit at the Maiden Claiming $75,000 level. After that he ran in back-to-back Grade 3 races on synthetic and turf. He ran well in those losing by less than 2 lengths in each one finishing third and fourth. The move back to dirt and the rail position should keep him in the running for a piece. 2. Pioneerof The West (12-1 ML) – The longest shot on the morning line is also the most experienced horse. He has 5 career races with 1 win and a second place. He ran a close 5th in his second career race in the Oak Tree Juvenile Turf before finishing 2nd in his third race on the dirt. He broke his maiden in his fourth start before being crushed in his latest start, the Eddie Logan (9th by 12 lengths). He seems to be a step below these right now. 3. Rockinatten (7-2 ML) – He has three races and all came in South Florida. His last race was his maiden breaker winning by 8 3/4 lengths after getting into a speed duel. Now he moves to the barn of Doug O’Neill and makes his first start around two turns. Given how he ran at 7 furlongs, the distance should not be a problem. From a win angle, it is probably best to wait and see if he can run in this spot after the barn change. 4. Unblunted (6-1 ML) – After breaking his maiden at Santa Anita in his second start, he tried going longer on all-weather in the Gold Rush. He ran an even race, but was unable to make up ground and finished 5th while beaten 3 1/2 lengths. While that was his first route race, this is another to pass on given the fact he could not beat weaker in the Gold Rush. 5. Rock Shandy (8-1 ML) – Here is an interesting case of a turf horse trying dirt for the first time. He ran his three career races on turf finishing first and third in his last two. The latest was the Grade 3 Del Mar Mile where he lost by 2 lengths. While he certainly appears best suited to stay on turf, this is not a bad position to try him on dirt. If he can handle dirt and stay off the pace, he can have a solid chance here. 6. Papacoolpapacool (8-1 ML) – Another one who is making his first career start on dirt. He has four races, all on turf, with a win, a second, a third, and a sixth place finish. The last came in the Grade 3 Del Mar Mile where he was simply outkicked in the stretch. He too has mainly a turf pedigree, but he finished behind Rock Shandy last out. 7. Calculator (8-5 ML) – The morning line favorite is the only horse in this race to NOT have a win on his resume. So why is he the favorite? His back-to-back second place finishes in the Grade 1 races the Del Mar Futurity and the Frontrunner. Both times he finished behind American Pharoah, one of the top 2 year olds in 2014 on the West Coast. He has not raced since the Frontrunner at Santa Anita on September 27, but he has trained quite well leading up to this race. He certainly figures to be right there in this race. 8. Hero Ten All (4-1 ML) – His first race was a second place finish to Dortmund, who is currently 3 for 3 in his career including the Grade 1 Los Alamitos Futurity. Hero Ten All came back to win his second race at 1 mile while coming from off the pace. He figures prominently in this spot and will be contending for the win. Check back on Saturday night for a review of the race. The Wild Card round was pretty dull until the final game between Detroit and Dallas. That game more than made up for lack of action with a flurry of missed calls and the penalty that was not midway through the final quarter. We can only hope that the Divisional Round produces as much excitement as the Lions-Cowboys game. After going 3-1 last week, let’s hope we can make it 4-0 this weekend. What a game to start the weekend with. The top seed in the AFC, the New England Patriots, will be playing the Baltimore Ravens at home for the fourth time in the playoffs. Baltimore has a winning record in the first three games at 2-1. However, those games came in the 2009-10 and 2012-13 seasons. The latest game between the two teams was in Week 17 of the 2013 season where the Patriots won 41-7 on the road. What makes the Ravens so good at beating the Patriots is they get pressure on Tom Brady. Doing so again would be advantageous once again for the Ravens, but they also need quarterback Joe Flacco to keep excelling on the road. Flacco owns a 10-4 record in the playoffs and has 7 wins on the road. For the Patriots, they will need to protect Tom Brady to have enough time for him to find his targets. His primary target will be Rob Gronkowski, but if the Ravens take him out of the plan the Pats still have a myriad of other options. Prediction: While the Patriots are favored by a touchdown, this game feels like it is a field goal difference. The Patriots find a way to win 24-21. After last week’s expected win at home against Arizona, the Panthers travel to the Pacific Northwest to face the Seattle Seahawks. These two teams are familiar with each other as they have faced off during the regular season the last three years. In 2012, 2013, and earlier in 2014, the Seahawks traveled to Carolina and won all three games. None of the games were high scoring with all three of them also being close until the end. The average score was 14 to 9 in favor of the Seahawks. The one thing to note is that the Seahawks are now playing at home against the Panthers for this first time since 2010. The Seahawks won that game 31-14, but that seems like ages ago given how they have been built into a Super Bowl Champion. The Seahawks boast a 7-1 record at home this season while the Panthers have struggled on the road going 3-4-1. Once again, this game figures to be defensive in nature, but the Seahawks are getting hot at the right time. They are winners of 6 straight and have yielded a total of 39 points in those 6 games. In only 1 game have they given up more than a touchdown. That happened to be on the road at Philadelphia. Prediction: The combination of Russell Wilson and Marshawn Lynch (and how could we forget the defense?) will be too much for the Panthers. Seattle wins 27-3. This game will be dictated by how well Green Bay quarterback Aaron Rodgers can play through his calf injury. He was clearly bothered in the season finale against Detroit and even missed some game time due to the injury. If he is at 90 or 95%, the Packers will be tough. However, we will not know who healthy he is until game time. For the Cowboys, they look to continue their perfect road record for the season. They will be lead by DeMarco Murray, who led the NFL in rushing with 1,845 yards. He will be tested by the always dangerous linebacker Clay Matthews on the other end. The Cowboys also have the dynamic Dez Bryant to catch passes from Tony Romo. Bryant was held to only 3 catches for 48 yards last week against Detroit, but he had 6 touchdowns in the final 3 regular season games. The Cowboys are certainly not a popular choice after last week’s controversial game, but they have a shot if Aaron Rodgers is not healthy enough to make the passing game go. Prediction: Rodgers is good enough to lead the Packers over the Cowboys, 28-21. The Colts come into this game off a 26-10 win against a listless Cincinnati offense that struggled to do much on offense without A.J. Green. Now, they have to face the Denver Broncos on the road. The two teams met in the season opener with Denver racing to a 24-0 lead before halftime and then led 31-10 midway through the fourth quarter. The Colts came back with two touchdowns in the in the final half of the quarter, but their rally came up short as they lost 31-24. Andrew Luck had a solid game going 35 of 53 for 370 yards with 2 touchdowns and 2 picks. He also ran in for a score. However, another two interception game would probably cost the Colts once again. Facing him on the defensive side for the Broncos is Brandon Marshall who returns after a foot injury. Meanwhile, the Broncos have a bit to worry about with their quarterback Peyton Manning. There is little doubt he is still one of the best quarterbacks in the league, but the final quarter of the season have some concerned. In the final four games he failed to throw a touchdown twice and had 6 interceptions. His game at Cincinnati was particularly worrisome because he had 4 picks compared to 2 interceptions and appeared to not have the same velocity. The game time temperature for Sunday will probably be in the 30’s, which may be an issue. Prediction: Andrew Luck and the Colts manage to go into Mile High and win 31-28. Enjoy the wonderful playoff action this weekend!